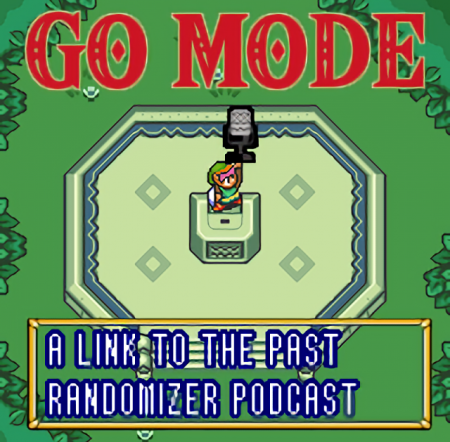 A Link to the Past Randomizer Podcast! Podcast Feed Has Been Restored! Our podcast feed experienced some downtime from April 11 – April 15 but is now back up again. If you attempted to download an episode or listen to one directly from this site during that time, please try again now and you should be able to access all episodes again. Apologies for the downtime and any inconvenience it may have caused! Go Mode is brought to you by timp, Axeil, & Hurfydurfy, members of the aLttP Randomizer community at large. Every other week, Go Mode will feature two things: Randomizer News, and Randomizer Walkthroughs. News could include updates on new versions of the logic, tournament recaps and predictions, interviews, discussion, debate, and anything else that counts as a “current event” in the aLttP Rando community. Randomizer Walkthroughs may include breakdowns of dungeon logic, tips for defeating bosses, and even more abstract concepts like item gambling or rupee farming. We also welcome listener questions! Use the contact form on this page or email us at email@gomodepodcast.com to connect with us.